Upsets were the trend during the 1A boys state quarterfinals Wednesday in Baker City, and No. 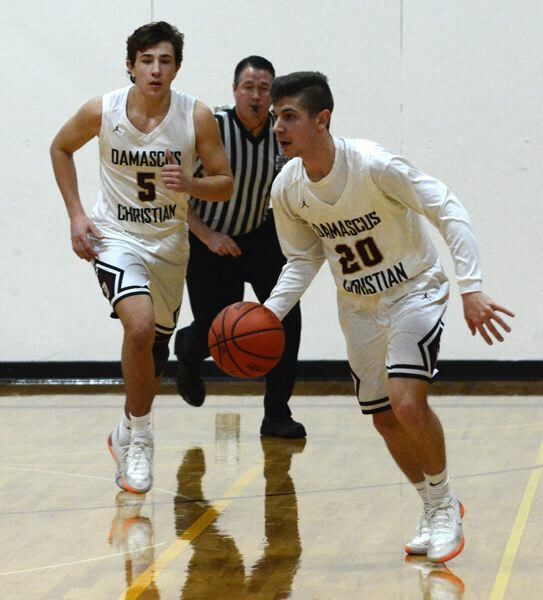 2-ranked Damascus Christian was unable to avoid the reaper with a 60-47 loss to Days Creek. Damascus made its final charge with five minutes to play when Jason Budey drove to the basket for a layup, while a whistle away from the ball gave possession immediately back to the Eagles. Teammate Jacob Zakharyuk launched a 3-pointer that rattled the rim and popped out. Budey hit the boards and was fouled on a third-chance attempt. He knocked down one free throw, while a lane violation erased his second shot. Damascus was within 46-42 with 4:37 to play, but would get no closer. Zane DeGroot built the Wolves back up in a flash by burying a 3, followed by a bucket in the pain on the next possession. It was a rough shooting night for Damascus, which knocked down only one out of every three shots. The biggest gap came from behind the arc where the Eagles shot just 4 of 16 (.250) and were outscored by 21 points. Damascus gained its biggest lead at 21-15 after Jacob Zakharyuk hit a 3-pointer midway through the second quarter. The Wolves had it down to a single point by halftime, then went on a 12-3 run coming out of the locker room to gain a lead they would never surrender. The top four ranked teams in 1A all dropped into the consolation bracket after the quarterfinal round. Damascus take on Triad at 10:45 a.m. Thursday morning. The Damascus Christian girls face Days Creek in the quarterfinal round of the 1A girls tournament at 3:15 p.m. Thursday.